Pics taken by a friend two days after the big earthquake. “Get back in the car and drive off of the bridge!! !” These words broke the chaotic, rancorous silence as I anxiously shouted in the local language at our terrified cab driver. My world was in the process of crashing down. . . literally. It was May 12, 2008 at 2:28pm. My good friend, Paul Quiros, was with me. I had been working with him all week in investigating the possibility of his law firm opening up a practice somewhere in this country. Our second leg of the journey landed us in the middle of a bridge, seemingly at the end of the world for most people in my life in America. As we drove and talked and prepared for our next meeting, the bridge underneath us abruptly began moving. When I say moving, slamming back and forth is more like it. It was a packed road. There were buses and trucks and cars back to back as far as the eye could see. EVERYONE panicked in abject fear, abandoned their vehicles, and ran. No one really knew where they were running, but frantically run they did. Paul had the presence of mind to yell that we had a better chance of survival by staying in the car and getting off the bridge than we did running. I screamed at our driver to get back in the car and drive. His eyes were literally glazed over in total shock, as he miraculously got back in the car without protestation, carved through the sea of abandoned vehicles, and dashed towards stable ground. I assumed that it was the case of a bridge that had finally succumbed to the toll of heavy usage and shoddy construction. It would collapse. We were just hoping to get off of it prior to complete destruction. We made it off with the bridge still intact. Now the problem took on a new tone, as we soon realized the earth was STILL convulsing violently. 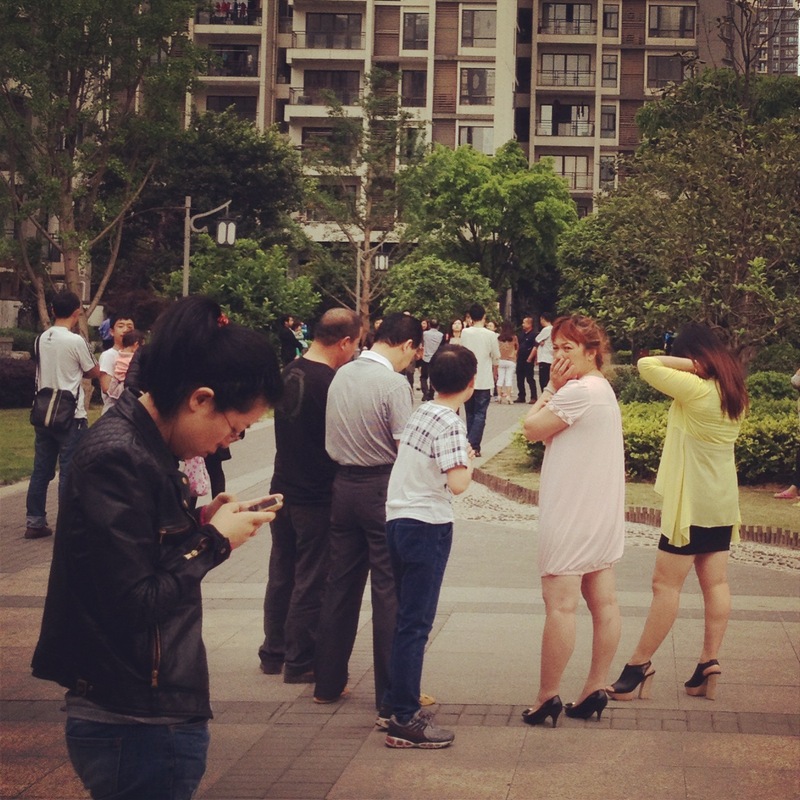 By this time, people were cascading out of the towering Asian buildings which lined the roads. It was chaos in a way I had never experienced. It was my first earthquake. It was a moment in time I will never forget. There was an eerie silence following the terror of the earth moving under our feet. The ground beneath your feet is not supposed to move. We take this for granted. It is supposed to be stable, solid, consistent. It had always been that way all my life, until May 12, 2008. Aftershocks continued every 10-15 minutes for the next few days. It was miserable. The aftershocks were bigger than most earthquakes. Paul and I were staying in a hotel in the city. I was on the 15th floor and Paul one below me. We literally slept with our suitcases packed and by the doors of our rooms, with our passports readily accessible. We were ready to sprint out of the unstable building, if need be. All night, I would be woken up from my bed shaking, run to the window and see if buildings were falling down around us. Thankfully they never did. It was an awful time, made much worse over the next few days when the death toll began climbing. All told, over 90,000 deaths and 5 million people were left homeless. It was devastating to this region, to say the least. Paul and I were able to get out of the city the next day and flee to the final destination of our trip. After two more days of meetings, he was on a plane for America and I was flying back to my home city. It was then that my emotions finally caught up to me. Two of the cities which were crushed, with tens of thousands of deaths each, were cities I had spent time in over the years. My mind raced to the locals I had met there. There were thousands of families in those two cities who were waking up that morning without their child or husband or father or wife. There were thousands a families whom would never experience life without the pain of what was lost at 2:28pm three days earlier. There were over 19,000 school-age children killed in an instant when their school buildings collapsed on their heads. My friend met a boy whom had jumped out his classroom window in a knee-jerk reaction to his school giving way beneath him. He clung to a tree, while his classmates were all buried in rubble. He was the only survivor of his school of around 300 students. Every one of them died in that wrecked school building. All of this raced through my mind as I leaned my head against the window of that plane. I wept. Though I’m sure it was a strange site, no one seemed to mind. The entire region was in a collective state of depression. I was merely expressing mine on the plane that day returning to my home city just three days after the worst natural disaster in this region in modern history. One which I was a part of and one which was/is deeply personal. May 2008 is back in my mind this weekend. Yesterday at 8am, we had yet another earthquake. This one was much smaller and I am located much further away from the epicenter this time. It was big enough here to shake buildings and cause panic. Lots of people running for exit stairwells and standing outside of buildings in fear of them collapsing, but not nearly as bad as 2008. That said, there are over 180 dead and 12,000 injured from this earthquake (with numbers sure to rise in the coming days). I took this after the earthquake yesterday. Many fled to outside and waited to see if the buildings were safe. I’m also thinking about the Boston bombing last week. Phil Autry, a best friend since childhood, completed the marathon about an hour prior to the bombs (grateful he is an incredible runner). His wonderful wife, Jie Xia, stood in the location of the bombs cheering Phil on one hour before their detonation. I don’t even want to think about the “if” they had been there when the bombs went off scenario. Thankfully they were out of the area, but others were not. It is tragic. In processing all of this today, I have been drawn to read and think through Psalm 46 in the Bible. Though we will never understand all of the “whys” involved in awful tragedies like these three, I praise God that. . .
God is with us, even when we can’t make sense of what is going on around us. He has not promised us that tragedy will not touch us. We live in a sin saturated world which affects not only the minds of crazed bombers (like those in Boston last week), but also violent, broken weather patterns. However, God does promise us that though. . . The nations rage, the kingdoms totter; he utters his voice, the earth melts. The LORD of hosts is with us; the God of Jacob is our fortress. God is sovereign and good. In the midst of pain and desolation, God is still God. He is still good. He is still “giving us a way out” through the finished work of the cross. In the midst of it all, I am simply praying that I (and you) will. . .
“Be still, and know that I am God. I will be exalted among the nations, I will be exalted in the earth!” The LORD of hosts is with us; the God of Jacob is our fortress. Though I don’t understand this all, I praise God that He is still here. His grace is still efficacious. He is still good and in control. However, we still need to pray for those affected. We still need to help where and when we can. Christ would call us to sacrificially give to and work towards redemption and grace in the midst of these tragic calamities and all others. I have seen this through the earthquake of May 2008 and I am praying the same with both Boston and the earthquake here yesterday. In the midst of the tragedies and calamities of this world, I simply pray that the kingdom of God will shine bright and expand for the good of this world. Today, I am especially praying for the 180+ families that woke up this morning grieving the tragic loss of dearly loved ones, both in Boston and in this region of the world. I have been thinking and praying for you and those in your circle a lot since Saturday. Although, I am not really sure what Asia means, although think I have figured out from your photos and some of the things pieced together about the language you speak on a daily basis. And although Asia is a very large place, even if you were not directly affected, you would be indirectly affected. I (and my students who just finished a unit on how changes in the nature of earth cause natural disasters) will continue to pray for you, your big family there and the people who have been deeply affected. Please let me know if ther are specific needs…I have a great little group of compassionate younger brothers and sisters. Thanks a ton, Alexis. Please keep praying, as I’m sure this will be a long process. Thanks! Glad to know you are okay. The photos I’m seeing on-line both for the earthquake and the Boston Marathon are devastating! I’ve experienced an earth tremor here and I was frightened, I can only imagine how it would be like to experience an earthquake. Praying for y’all. Yeah, it’s a strange thing being in an earthquake. This one was much smaller than the last, but still rough in the most affected areas. Strong perspective, this was much appreciated. Solid post sir. As soon as I heard about the earthquake in your area, I began praying. I’ll keep on in a state of prayer as you minister to those who are suffering loss and grieving. Thanks Mrs. Ward. . . hope you are doing well. Congrats on your soon to be grandparenthood! Both the earthquake in Asia and the Boston Marathon are devastating. Keeping you and all who were affected in both tragedies in my prayers. Stay safe. Love & Hugs!! I lived it all over again John. Many times this past week and your words and His word are good reminders of our need to rest in Him. Appreciate you Gunter. Tom, I’ve actually thought about you guys a good bit the past few days. It was a rough time for all of us, but especially you guys. Great hearing from you . . . please give your family my love! Good post, Gunter. Our friends back in the “old country” have been on our minds. The “old country” misses you, my friend. Thanks for checking in on the blog here. Good hearing from you! Great thoughts, John. Scroll to the bottom here http://hopefulrealism.com/2013/02/an-interview-with-isaac-wardell-of-bifrost-arts-part-1-ft-psalm-46/ for a great musical rendition of this Psalm. Thanks Ryan. . . definitely will look into this. Hope you are well up there! Anybody who has got a Christian worldview and looks up to the Bible as God’s Word understands that all these horrible things, devastating events, are but a warning that this tormented world is drawing to an end. Luke 21: 10: Then he said to them: “Nation will rise against nation, and kingdom against kingdom. 11 There will be great earthquakes, famines and pestilences in various places, and fearful events and great signs from heaven. 25 “There will be signs in the sun, moon and stars. On the earth, nations will be in anguish and perplexity at the roaring and tossing of the sea. 26 People will faint from terror, apprehensive of what is coming on the world, for the heavenly bodies will be shaken. 27 At that time they will see the Son of Man coming in a cloud with power and great glory. 34 “Be careful, or your hearts will be weighed down with carousing, drunkenness and the anxieties of life, and that day will close on you suddenly like a trap. 35 For it will come on all those who live on the face of the whole earth. I pray for the people in Boston and the people in Asia, may God see them through these terrible times! I pray for us to remember His Word. John 14:29 – I have told you now before it happens, so that when it does happen you will believe. “Do not let your hearts be troubled. You believe in God; believe also in me. 2 My Father’s house has many rooms; if that were not so, would I have told you that I am going there to prepare a place for you? 3 And if I go and prepare a place for you, I will come back and take you to be with me that you also may be where I am. (John 14). Thanks for your thoroughness on this. . . many Godly, intelligent people have had differing interpretations on differing parts of Scripture. Thanks for your thoughts here. Sobering but excellently written post here John. Our hearts were likewise gripped by the Boston bombing and the earthquake there. We’ve been praying both for you guys there and all the rest of the people affected by both tragedies. Praise God that in all these, His Word brings comfort and encouragement. “God is our refuge and strength, a very present help in trouble. Therefore we will not fear though the earth gives way, though the mountains be moved into the heart of the sea, though its waters roar and foam, though the mountains tremble at its swelling.” Very true. We miss you guys and we miss being there. Shalom! Thanks Deanna, great hearing from you! Miss you guys a ton over here. Much has changed, but still enjoying life in this region. Hope you guys will come back and visit before too long! We in Manila are warned of a Big One… earthquake with a magnitude of 7+ or more. Yet no one can really be prepared. It’s only in HIS hands we are safe. I was in a different city when that Asian earthquake happened. Yet before going back to the Phil. I needed to go to my previous city. I visited a girl whose leg had to be amputated in a hospital. She is one of the victims from that school which collapsed. Tried to bring hope in words, with my broken language. Glad somebody filled in the gaps for me. I did cry too. Loss of lives. Offered prayers for the living. I can vividly picture your experience. Thanks for sharing. Faith Ann, great hearing from you. . . it’s been a long, long time since I have seen you! I hope you are well, my sister in Christ.